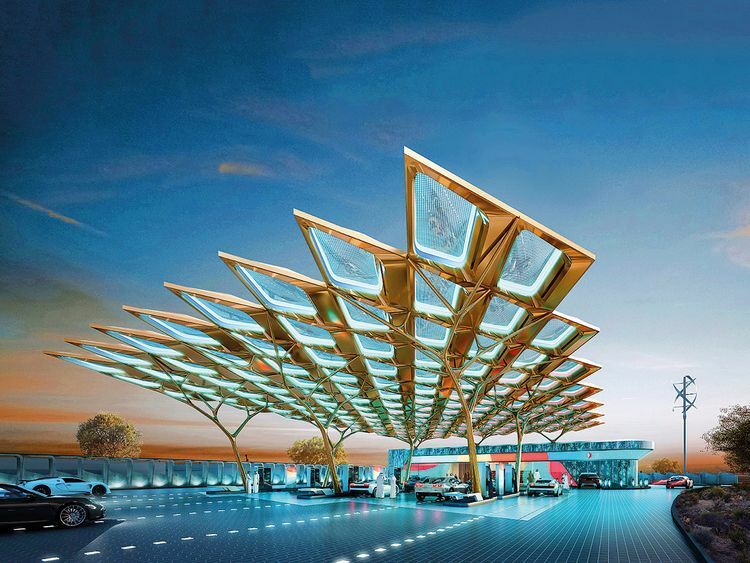 Dubai: The Enoc Group has unveiled a new concept design service station that is modern, sustainable, and architecturally unique and which will be located on the Expo 2020 Dubai site. The new station draws from the rich heritage of the UAE’s traditions in the form of its national tree, the Ghaf, which was adopted by the UAE government earlier this year to symbolise the Year of Tolerance. The Ghaf tree is known for its high sustainability and deep roots that make it resilient even in harsh weather conditions. The station is built on an exoskeleton of the Ghaf tree structure, which acts as supporting columns for the carbon-fibre canopy — a light material three times stronger than steel. This is the first time that carbon fibre is being used to construct the entire structure of a service station canopy. It makes the Ghaf Tree station the first LEED (Leadership in Energy and Environmental Design) Gold certified service station in the region. “The Ghaf tree service station is our way of celebrating the UAE’s rich heritage. Our nation’s successes have been largely influenced by its rich culture and deep-rooted values and traditions. These traits were the setting stones for our journey towards prosperity and will undoubtedly continue to propel our nation forward,” said Saif Humaid Al Falasi, Group GEO of Enoc. The Ghaf Tree service station will serve the Expo 2020 Dubai fleet during the six months of the Expo, contributing to the delivery of a successful event. In the legacy phase of Expo, the station will serve District 2020, a highly accessible, well-connected urban development. For the first time in the region, Enoc will be implementing wind turbines to generate an average of 30 to 40 kilowatts (kW) of power from wind energy.